Warren Etheredge can help you find the stories you need to generate the content your customers crave. I talked with Warren about his Storyfinding method and about the art of conversation in general and interviewing in particular. Warren Etheredge is a Storyfinder who can, as he puts it, “mine narrative gold anywhere, from anyone,” a skill he has honed teaching for over 25 years and conducting over 3,500 interviews. 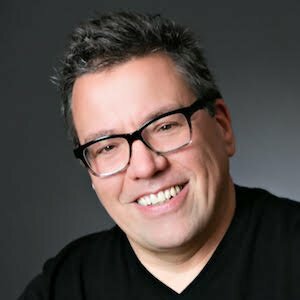 Warren is one of the founding faculty of TheFilmSchool, helping filmmakers translate their stories for screens big and small, and The Red Badge Project, helping combat veterans work through PTSD and other issues by teaching them the art of storytelling. In the Fall of 2017, he launched a new 30-week screenwriting program at the University of Washington and was appointed the VP of Curation & Acquisitions for Heyou Media. He hosts The High Bar, his Emmy-nominated television series devoted to “raising the bar,” Scene! & Heard for GreatMovieScenes.org and hosted Reel NW on KCTS. He has also served as the Chief Storytelling Officer for Enthrall Sports. He is the Co-founder and Curator for the Walla Walla Movie Crush, America’s most intoxicating blend of short cinema, and the founder of The Warren Report. He is a published author, staged playwright, successful producer, veteran festival programmer and much sought-after public speaker.